What do I Need to Prove at Trial in a Products Liability Lawsuit? In a products liability lawsuit, you need to prove that a defective product injured you and caused your damages. What Are The Elements Of A General Produts Liability Claim? What Are The Different Kinds Of Products Liability Cases? What Are Most Common Defenses In Products Liability Cases? Concerned What Kind Of Products Liability Case You Should File? You were reasonably using the product. You were injured while using the product. Your injuries were due to the product defect. As outlined below, there are different kinds of products liability cases. Therefore, these elements might function a bit differently at trial but the relative framework will be the same. What you need to prove at trial in a products liability case depends on what type it is. Here are the elements of the three main varieties and examples to help illustrate them in practice. 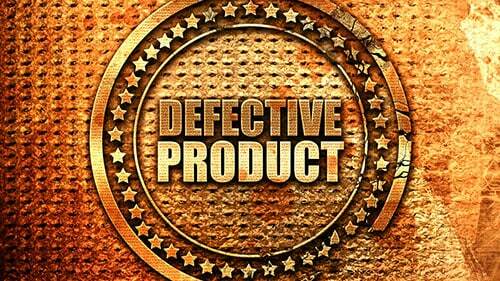 4) The plaintiff was injured because of the defect in the product. An example of a defectively manufactured product that might trigger a lawsuit would be a pie with a screw in it. 4) The plaintiff was injured because of the design in the product. An example of a defectively designed product that might trigger a lawsuit would be brakes that stop working if the vehicle travels over 50 miles per hour. 5) The plaintiff was injured because of the lack of sufficient warning or instructions. An example of a product with defective warnings that might trigger a lawsuit would be a medication sold without instructions that pregnant people should not take it. The statute of limitations has expired. The plaintiff assumed the risk of the injury that resulted. The product defect was not why the plaintiff was injured. The plaintiff's conduct caused his or her injuries instead of the product defective. While these can be refuted, it helps to get out ahead and develop strategies for these arguments and others that the defendants might raise. The key is to look at the case elements and build a case of evidence and testimony underneath them that cannot be undercut by the opposing party. Rosenfeld Injury Lawyers LLC helps personal injury victims craft cases that obtain the maximum compensation allowed under the law. We can make sure that your products liability suit is designed most effectively and then help you present it in court. Just contact our offices and someone from the Rosenfeld Injury Lawyers LLC will speak with you about how you can get the recovery that you deserve. Who can I sue in a products liability lawsuit? What are examples of products liability recoveries? Does It Matter If The Product Had a Disclaimer, Warning or Other Instructions? How Soon Must I Bring My Products Liability Case? How Will Rosenfeld Injury Attorneys Help Me If I Have Been Injured by a Product? What Are Some Facts About Product Liability Accidents And Lawsuits? What Are The Laws Surrounding Products Liability Cases in Illinois? What Can I Recover From a Products Liability Case? What Have Other Products Liability Plaintiffs Recovered? Who Can I Sue in a Products Liability Case?